At South Coast Controls we work hard to deliver the very best of services and products to our customers. We want our customers to know that we are the most dependable and value-added panel shop on the market. Our partnerships and ability to work side by side with third-parties has given South Coast Controls the ability to provide our customers with advantages that other shops lack. 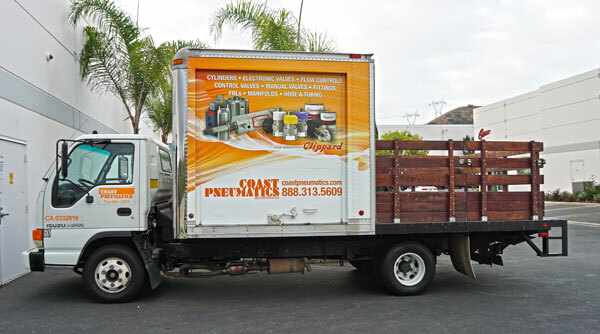 Recently, our Coast Pneumatics division and partnership has given us access delivery vehicles and trucks! We now are able to deliver directly to our local customers, in some cases even free local delivery applies! With our value-added capabilities, South Coast Controls has a variety of abilities that the competition does not! Our local delivery team will deliver straight to your doorstep. Deliveries are made on our own trucks by our own reliable employees. South Coast Controls is more than just a panel shop, we want our customers to benefit from knowing that we have access to resources and provide value-added capabilities that our customers do not! We also are not only limited to local deliver, we deliver out of the state and country as well! We are a GLOBAL provider! If you want to learn more about our company’s projects or the international work that we have done, click here! Contact us today to find out about our many options, and what we can do for you and your business! Anaheim, CA | Orange, CA | Tustin, CA | Brea, CA | Fullerton, CA | Corona, CA | Santa Ana, CA and various other locations within the Orange County, L.A. County and Inland Empire areas.